Recorded at the Lyttelton Theatre, National Theatre 4 November 2006. Mixed recording. 1 DVD. 2 h 40 min, including 20 min interval. The action takes place in an apartment in the Passage Du Pont-Neuf, Paris, time 1860s. I saw it Thursday 9 October 2014 afternoon from h 1.10 pm. When I went to the National Theatre Archive by appointment, all the stuff about the production was ready on my desk, on my previous request. Two binders full of stuff available in consultation!!! It has been a “dirty” pleasure to me to ascertain how a play works behind the scenes! 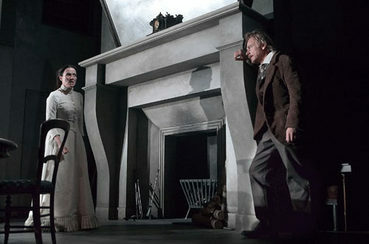 There’s a great study before the staging, expecially for costume plays like that. Ever detail has to be annotated, from the costumes sketches to the list of food and accessories the crew have to make ready for every scenes. I was gloating! Well, I supposed so before, but I was not entirely aware of the full production experience! For example, I never thought they could need to consult a psychologist for the general meaning of the story! There is his letter to M. Elliott to testify it. It was raining outside, so the perfect mood to see this play. It’s a dark, desperate, passionate story. Despite it starts with some cheering guests at the house, we immediately notice that Thérèse is not a happy woman. She looks depressed. She lives in a big gray house and is not much talkative. She’s married to her cousin and they live together with his mother, who dearly loves her niece. 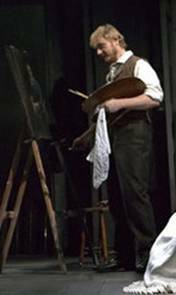 The painter Laurent, who’s painting a portrait of Camille, is welcome to the house, as well, but Camille doesn’t understand why his wife can’t stand him. But it’s a farce. When they remain alone in the room, the illecit passion between them comes out and makes them talk with passionate words. They hug and kiss and dream to be together in a new life. New life means Camille must die. They agree on it. 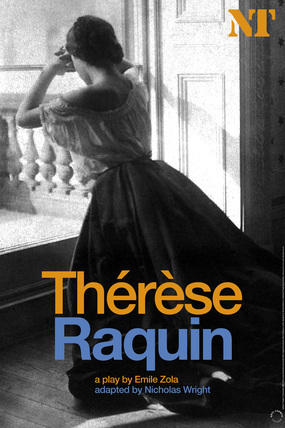 We don’t see the murder, but we can get it’s happening because, in a silent and yet moving scene, Thérèse is having a bath and changing her light dress with a black one, while we hear a man screaming. Then she returns to her guests but Camille is not in the room anymore. His mother is crying. Friends are in pain. Camille drowned in the river. By accident, they think. But we know Laurent killed him. Yet, the lovers must be prudent after the funeral. With ability, Laurent makes his wedding with Thérèse happen. Her aunt blesses their marriage. She thinks he’s faitful to his dead son and she wants the best for her niece. 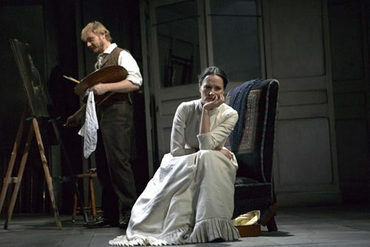 Laurent is full of desire but Thérèse becomes estranged. A man lost for love. She doesn’t indulge herself to passion anymore. Every encounters becomes a fight where she refuses Laurent, who’s desperate and tries to force her to make love. Even worst, they start to hear the voice of a screming man in the night and to see something in the shadow. They can’t even sleep and slide above the pavement struggling like wild animals. There’s a great scene divided in two, where she’s standing alone inside her room, frightened, while Laurent is walking down a dark street like if he couldn’t go further. It remainded me of the Jean Cocteau’s Surrealism of ‘Le Testament d’Orphée’! 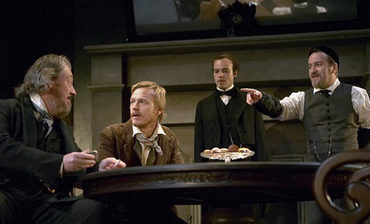 The play turns a bit like a crime story. The aunt, who found out the truth, paralyzed on a wheel chair for the shock, tries to tell to Camille’s friends, writing letters with a hand on her desk, that Thérèse and Laurent are murderers. She doesn’t succeed: their friends go away, unaware of what is going on, and she remains alone and incapable to prevent Thérèse and Laurent’s double suicide, a silent witness. Not only this comes from the pen of a great writer. 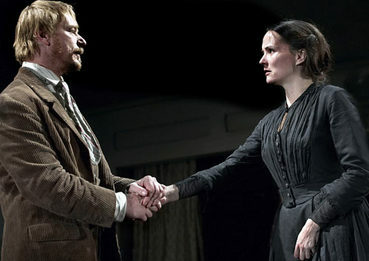 This play brings you in tension until the end. Must have been great to have seen it inside a dark theatre. Once again, Marianne Elliott is a great director. So far, she always surprised me with her bold choices. You never know how she’s going to adapt what comes from a book. 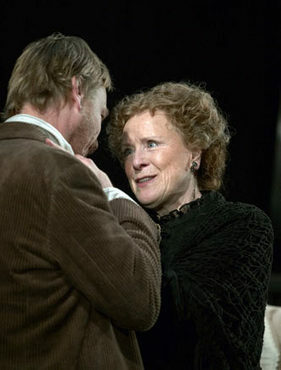 Now, to the cast: the secondary characters remain in the background, but Judy Parfitt was very moving in the scenes where she couldn’t move and talk. She looked like a ghost on her wheel chair. 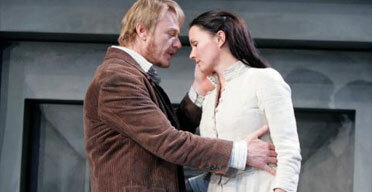 Ben Daniels and Charlotte Emmerson are fully “in tune” with each other, the love scenes are sensual, their Laurent and Thérèse are intertwined like ivy to a wall. In fact, they fall together. Their desperation and fear are genuine, too. 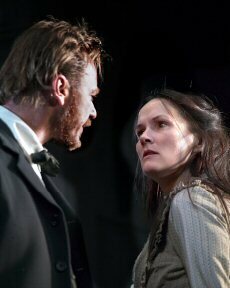 The gave an excellent, moving performance. Set design: detailed interior of a wooden house, some furniture, a fireplace, a table, windows, doors; we catch a glimpse of a kitchen and of stairs going down. An easel at the centre of the room. The bedroom is behind a curtain. Costumes: typical ‘800s clothes, inspired by Impressionist paintings and old pictures of artists of that age. Soundtrack: sounds and screaming, which give oppression. P.S. To be precise, Émile Zola had Italian heritage and surname was pronounced Zòla (Zolla), but he changed it in Zolà! Much posh!